42% of all activity on the list happened during a five-week period after the Softimage EOL announcement. One last look back at 2012. This time for si-community. Here’s a forum bubble chart that gives an at-a-glance overview (of the top 5 forums based on number of views). The size of the bubble indicates the number of views; the X-axis is the number of topics created in 2012, and the Y-axis is the number of replies. This data was obtained by visiting all the forum pages (such as all 9 pages of the News forum) and extracting the number of posts, posting date, number of replies, and topic title from the html. 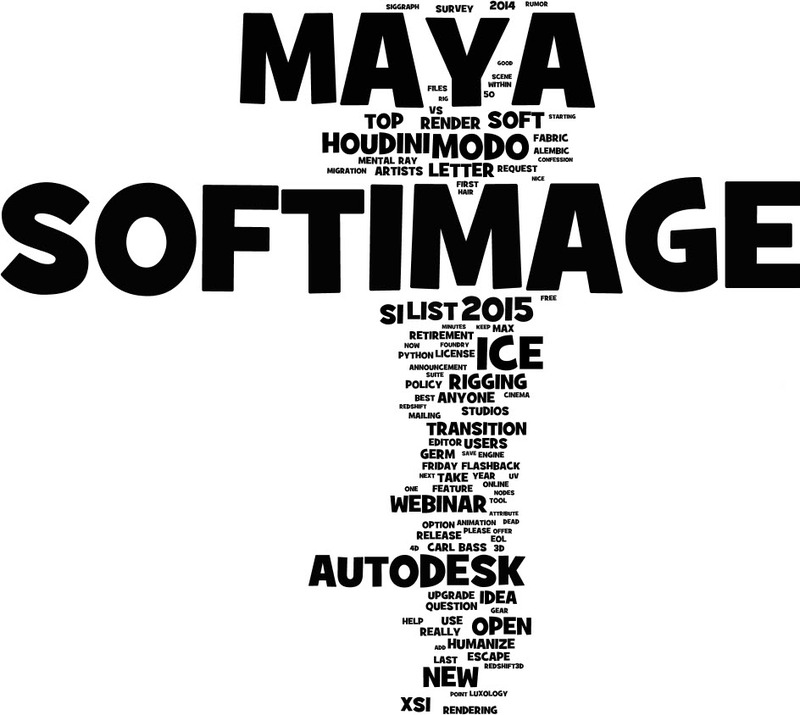 Two word clouds to help visualize the activity on the Softimage mailing list during 2012: who was posting, and what were they posting about? What were the popular topics? Note that I removed “Softimage”, which was by far the most common word in the post titles (aka Subject), but which doesn’t really indicate the topic of discussion. Who was active on the list? There were approximately 450 different people who posted during 2012. This word cloud shows the 100 top names, so assuming most people have no middle names, this is more-or-less the 50 most active posters on the list. Here’s some of the Softimage-related news and events that caused a buzz during the last year. October After months of malware warnings and the like, xsibase finally goes down…forever. RIP xsibase. August Autodesk Lays Off 7% Of Entire Staff and a number of current and former Softimage people were gone. May Autodesk reshuffles Softimage development team. The original Montreal staff moves onto Maya VFX, and Softimage development is now headed up by a team in Singapore. May Launch event for the Softimage Creatives user group, London chapter. 27 March Subscription prices change again. For Softimage Gold support, the price change was actually a modest decrease in price, from 900 to 890. BUT this is when many people found out that Softimage subscription prices went up significantly last year (in Europe only). March Softimage 2013 released…and the crowd goes wild. Feb V-Ray for Softimage released. This isn’t an exhaustive list, obviously, as there plenty of other things that happened during 2012, such as Exocortex Species, SOFTIMAGE|UeberTage 2012, NYC ICE workshops, MotionTools, ProceduralTopoPack, baEssential shaders, emPolygonizer4 version 4.0, Fabric Engine, Fabric Creation Platform, emFlock2, emTools, Exocortex Alembic, Autodesk Softimage Masters nominations for Benjamin Bracamonte, Jeremie Passerin, and Todd Akita, and a Junior Masters nomination for Normand Archambault.